the control systems of the high-speed train in Tianjin. BEIJING: In a move aimed at attracting investments into Johor and to study China's technology-driven infrastructure projects, Johor Sultan Ibrahim Sultan Iskandar recently visited the offices of China Railway 18th Construction Bureau Co Ltd (CR18G). CR18G is part of China Railway Construction Company (CRCC), which in turn is one of the three shortlisted Chinese companies that will be chosen as the main contractor for the Electrified Double-Tracking Project for Gemas to Johor Baru. This had been earlier agreed on a government-to-government basis. During the visit, Sultan Ibrahim helped secure a commitment from CR18G president Hao Chenyi, to invest in Johor and to open an office in Iskandar Development Region, according to a media release issued toStarBiz from the Johor Palace. In recent times, Johor has been seeing a lot of business activity and investments. Already the home to the ambitious Iskandar Malaysia project, other notable developments include Petroliam Nasional Bhd's proposed integrated downstream oil and gas complex in Pengerang (dubbed Rapid or Refinery and Petrochemical Integrated Development) and a plan to turn the Johor Baru waterfront fronting Singapore into an iconic development with a whopping gross development value of some RM80bil. Another significant development in Johor has been the transformation of the state's investment arm, Johor Corp (Jcorp), which started to take shape after Sultan Ibrahim's installation as the Ruler of Johor in 2010. From a debt-saddled entity, JCorp is undergoing a group-wide restructuring exercise primarily aimed at unlocking values within the group and streamlining its businesses that include such prime assets asKFC Holdings Bhd, plantation giant Kulim (M) Bhd and hospital chain KPJ Healthcare Bhd. 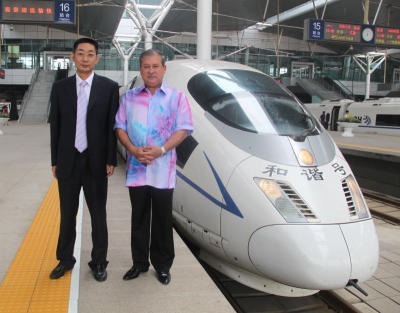 As part of the visit to China, Sultan Ibrahim was accompanied by Hao on a high-speed train ride from the city of Tianjin to Beijing, covering a total of 117km in just under 30 minutes at speeds of close to 300 km per hour. He was also briefed on the many different projects that had been undertaken by the CR18G team, including constructing what was known as the world's highest railway system, which runs from China's city of Xinjiang to Lhasa in Tibet. Other projects completed by CR18G include constructing one of the world's deepest tunnel systems, building flood mitigation systems as well as building hydro power generation stations in China. CR18G was also recently awarded the prestigious fast-train project between Mecca and Madinah by King Abdullah of Saudi Arabia. The Sultan of Johor has a deep interest in railways and holds the record as the first ruler to obtain a Class 26 locomotive driving licence a few years ago. “I have always had a keen interest in rail technologies and when I read that China had built the world's fastest train, I had to pay them a visit,” he said.